I wanted to take a little break from our vacation posts and toss in the Father’s Day dinner I made for my dad this past weekend. 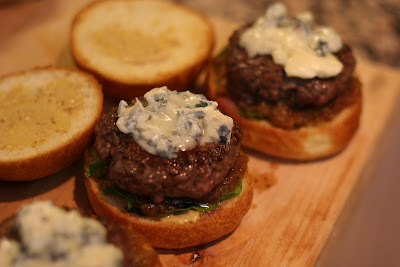 Now sliders aren’t something I think of for a special occasion dinner, nor were they something I’ve made before. 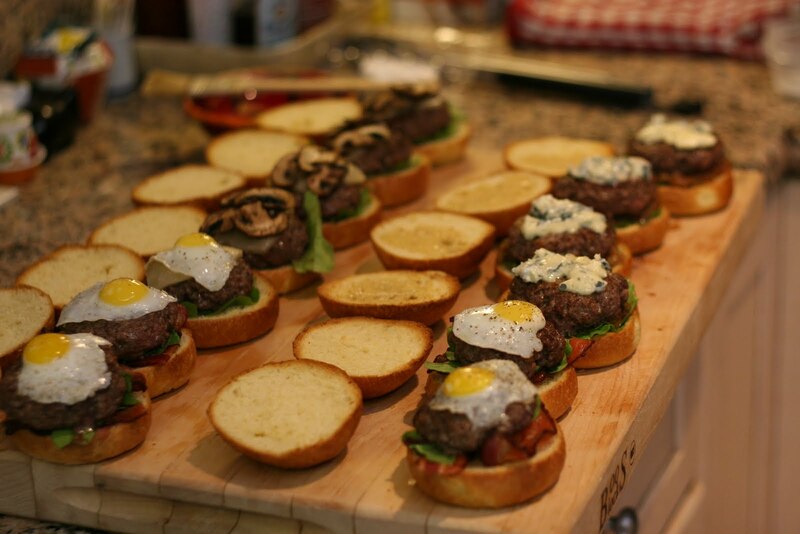 Sure, I’ve grilled up a few hamburgers in my day, but truth be told it had been awhile. Although it was Father’s Day, J rarely requests something so specific and was really rooting for the sliders idea so I wanted to find a way to fulfill his wish while satisfying my need to make it special for the occasion. 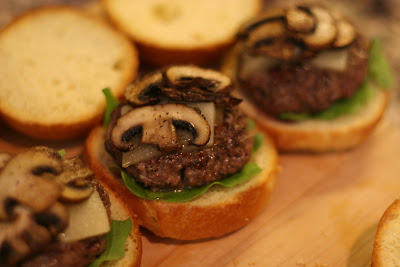 I called my friend Dylan for inspiration, and he suggested making several different kinds of sliders- use different meats, toppings, etc- go decadent with truffle oil or different cheeses, etc. That conversation definitely pushed me in the right direction and after a few minutes, we’d decided on a Trio of Sliders. 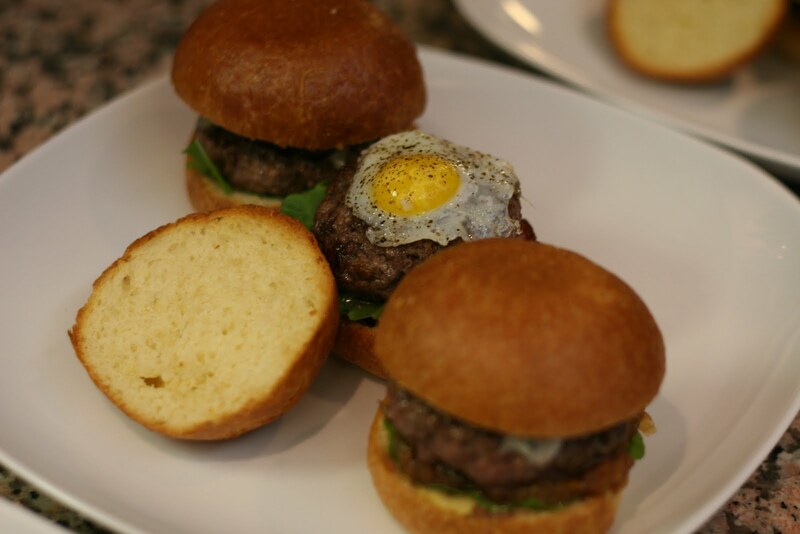 I bought the house hamburger from McCall’s which was nicely marbled with fat, ordered 2 ounce brioche rolls from Euro Pane, stopped at the CheeseStore of Silverlake for some cheeses and grabbed some fresh produce and quail eggs at the Silverlake Farmer’s Market and was good to go. I spent about an hour making my caramelized onion jam (with a touch of thyme, something I love in onion jam) and got the rest of my mise en place together before putting all of the elements together for dinner. The Blue Slider: Caramelized onion jam, Dijon mustard, arugula and St. Agur blue cheese. The exceptionally creamy St. Agur went so well with the sweet onions and the mustard cut the richness of it all. Probably my personal favorite of the night. 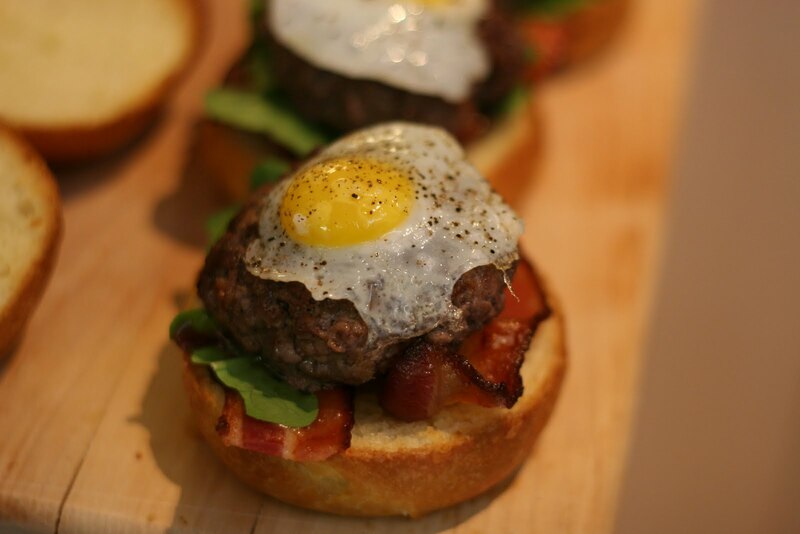 The Bacon/Egg Slider- White truffle oil, arugula, Nueske smoked bacon (also from McCall’s) and topped off with a sunny-side up quail egg. 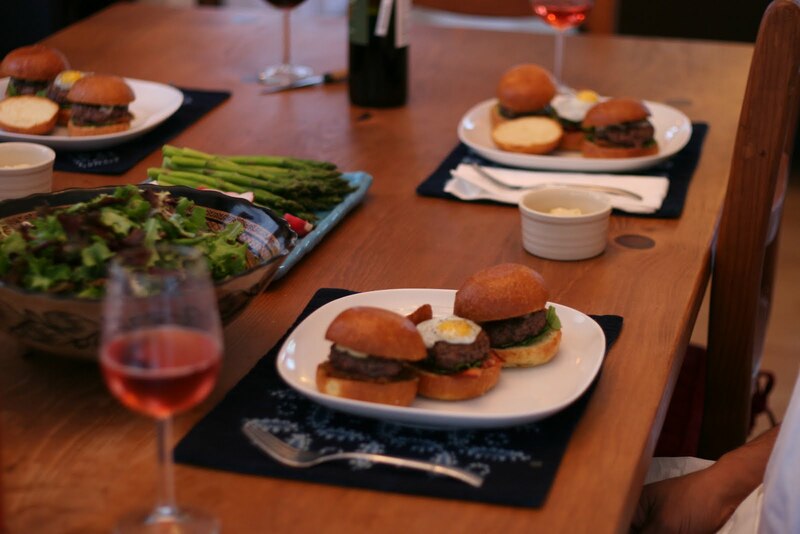 Once we sat down, we all broke the yolk and let it run over the burger….it’s like breakfast for dinner, but much more luxurious. I loved this one as well, and the quail eggs were surprisingly easy to get open without compromising the integrity of the yolk. 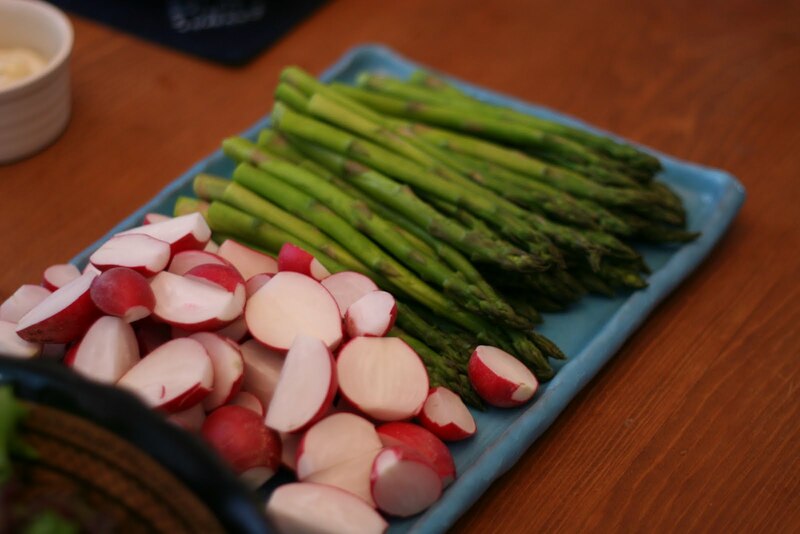 To balance out the rich sliders I just served a green salad, and a plate of blanched asparagus and crisp radishes with some Provencal aioli for dipping. All of the sliders were delicious- in large part due to the high quality of the ingredients. 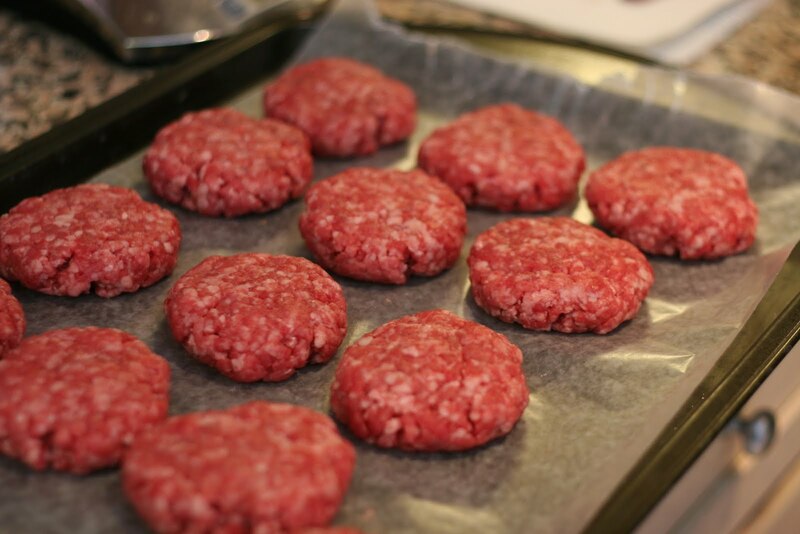 The ground beef at McCall’s is a mix of Angus and chuck and was super flavorful and moist. 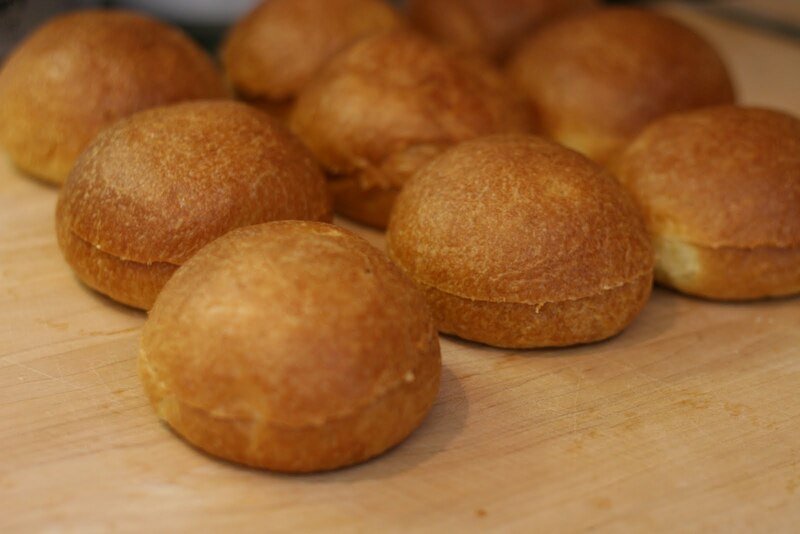 The ladies at the CheeseStore of Silverlake were so helpful in the process of choosing just the right cheeses, the Silverlake Farmer’s Market had some amazingly peppery arugula, bright asparagus and fresh radishes, and Euro Pane baked up the lightest brioche rolls. So thank you to all of the staff for making my Father’s Day dinner possible! Not only are you supporting local business by shopping at specialty stores, but it’s a fun and educational way to shop and you can avoid the neon lights of a supermarket altogether. 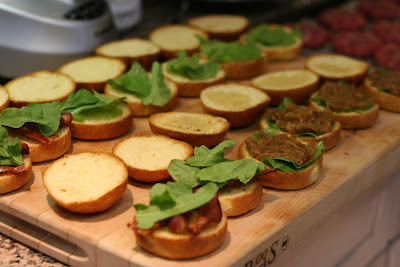 top ten tuna toast meals for sure! OMG TAG, these look fantastic! I have yet to go to McCalls...I must go soon! A: Thanks J! You're my favorite taste tester! A: I've never been to Pacific Dining Car..how is it? DG: Thanks! You must go to McCalls- it's seriously like shoe shopping- you go in for sandals, then you see some cute platforms, then some kickass boots....it's all so distracting cos it is all SO GORGEOUS. Good luck! A: Thanks P! Thanks for being such a great Papa! Erinn: The quail eggs were really easy to make- the yolks are surprisingly strong and none of them broke in the pan, which was great. Give it a try!